Signs of spring were late to arrive in Maryland this year. Still, as temperatures slowly rose and days lengthened throughout April, leaves grew on trees and plants sprouted into flower. Birds and spring peepers made their presence known through trilling song and chirping call, and insects began to take wing. Later this year, frosty mornings and honking skies of migrating geese will hint that winter is once again on its way. These familiar seasonal changes signal the passage of time for humans, but for plants and animals in nature, seasonal change is essential for survival—it triggers growth and new life stages, feeding and mating activities, migration, hibernation and other natural phenomena. How do animals emerge from an egg, find a mate or head south for winter at the right time? And how are plants cued to unfold from the soil, send flowers into bloom, produce fruit or go dormant come autumn? Scientists study animal physiology and behavior, plant form and function and seasonal weather patterns carefully to understand these recurring life events. This science is called phenology, which is derived from Greek phaino, meaning to show or appear. Studying phenology provides information about the life history of a species and the systems that underlie food webs and population dynamics. When it comes to phenology, nothing is as simple as it may seem. The interconnected nature of ecosystems means that one species’ seasonal life events affect many other plants and animals. For instance, the life cycles of many pollinator species in Maryland, such as native bees and butterflies, are aligned with the cycles of the plants that provide food for larvae, nectar for adults and host locations for eggs or transitional life stages. If the life events of the host plant and insect do not align—if, for instance, butterflies emerge before host plants emerge—the butterfly may not survive to reproduce. This falling out of sync is called phenological mismatch. Biologists track the phenologies of many plant and animal species, and apply this knowledge to manage habitats and conserve at-risk species.However, current understanding of the phenology of many species is far from complete, especially as the impacts of global climate change continue to affect temperature patterns. As average temperatures warm and weather patterns are altered, biologists are beginning to understand how some species are reacting, and possibly adapting, to the coming change. Changes in the timing of life events could have major implications for Maryland’s ecosystems, many of which include species near the northern or southern limits of their ranges. One such species is the Baltimore checkerspot, a rare butterfly that inhabits wetlands in the western and central parts of the state. A new study is taking a closer look at the relationship between the checkerspot and its host plants, as biologists investigate the possibility that phenological mismatch may be playing a role in this butterfly’s decline. The official state insect is a striking symbol of Maryland’s natural heritage, but is also a darker representation of the widespread loss of habitat and species. The Baltimore checkerspot (Euphydryas phaeton) pollinates many plant species throughout the state, but its primary host plant, upon which female butterflies deposit eggs and the larvae feed, is white turtlehead. 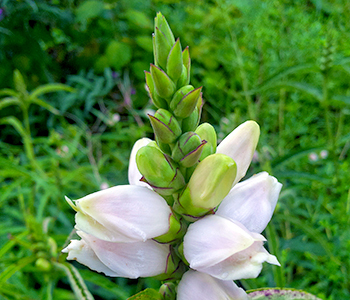 While this plant is common in wetlands, the loss of wetlands all over the state has decreased the amount of turtlehead available to butterflies. Other threats to turtlehead include intrusion by invasive species and consumption by white-tailed deer. Checkerspots used to inhabit 15 counties, but now occur in only seven. Most checkerspot colonies are located in western Maryland, mainly Garrett County. While the checkerspot continues to prosper in the northern United States and Canada, its apparent decline here raises questions about how warming temperatures and shifts in the growing period of turtlehead may affect the survival of checkerspot populations. Through a research project currently being carried out, biologists from the Maryland Department of Natural Resources Natural Heritage Program and Tufts University are examining the timing of the emergences of Baltimore checkerspot and the plants this species needs for survival. Beginning in late spring 2018, biologists are studying three checkerspot colony sites in central Maryland, where the butterfly’s decline has been most severe. 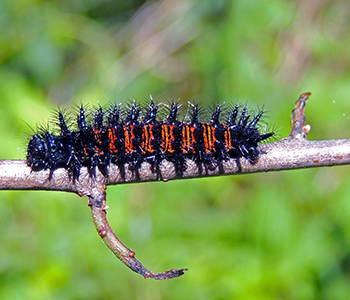 From April, when larvae first become active after the winter, through August, when adults have laid eggs and larvae are hatching, biologists will visit the colony sites up to three times a week to observe which host plants are available for checkerspot feeding and breeding activity. This research will span two years and will also take into account historical data of when checkerspot adults emerged in earlier years. In the field, biologists are keeping track of many aspects of butterfly habitat. They look for the all-important turtlehead host plants, especially when larvae emerge from winter dormancy and need to feed on this plant, and when adult butterflies are laying eggs on turtlehead. There must be plenty of turtlehead plants present to sustain a ravenous checkerspot colony. Around midsummer, when adults are emerging and flying, biologists will note the presence of nectar plants and the distance that adults have to fly to find food. These specifics and any underlying phenological issues will be revealed only by careful observation. As species struggle to maintain the rhythms of life in a warming climate, the checkerspot faces many threats to its existence here. Is shifting phenology among them? For now, as summer arrives hot and humid to Maryland’s wetlands, the Baltimore checkerspot will fly again. Article by Annalise Kenney—Wildlife and Heritage Service conservation planner. Appears in Vol. 21, No. 3 of the Maryland Natural Resource magazine, summer 2018.